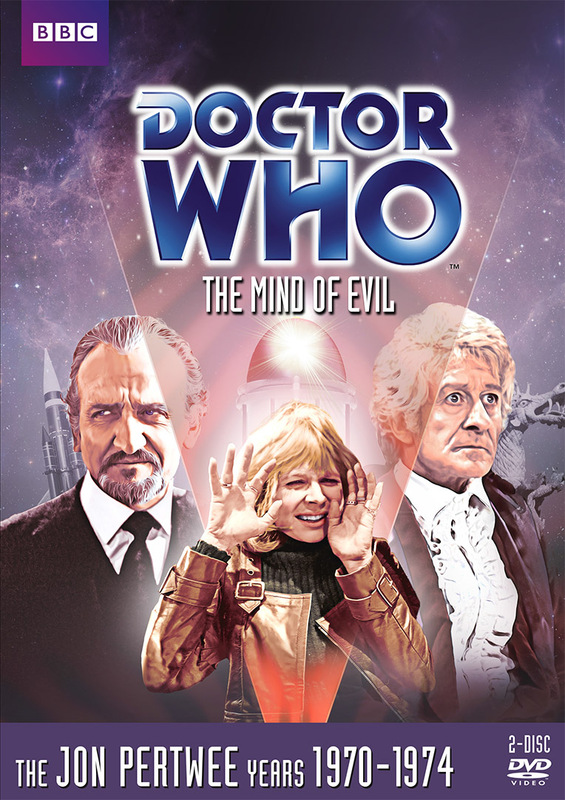 From the Archive: A British Television Blog: DVD Review: The Mind of Evil - Now in Color! The DVD release of The Mind of Evil completes a journey for me that I started back in 1985. 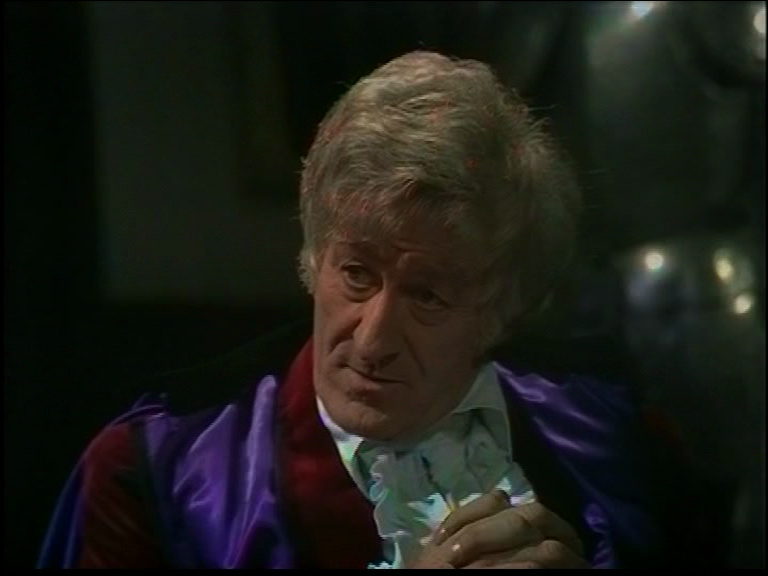 1985 was when I first saw episodes of the Jon Pertwee era of Doctor Who and also the first time I realised not all episodes of his stories were not in color but black & white. 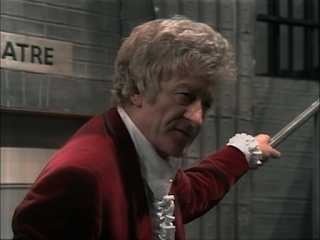 Between then and now, Jon Pertwee episodes that only existed in black & white have been restored through various methods and have been brought back to color. The Mind of Evil was always going to be the most difficult because only about 4 minutes existed in color out of 6 episodes. 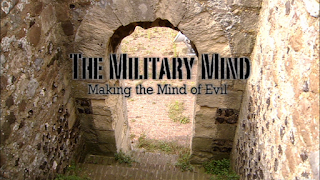 Jump forward to 2013, one can purchase The Mind of Evil In full color on DVD. Allow me to do the job of the BBC and explain what is going on with this release since they are unwilling to do so. If a casual fan were to pick up this story, released on 6/11, they may just assume there is nothing special about it. The fact is that there are a lot of things special about this release. Since the early 1980s, The Mind of Evil had only existed as 6 16mm black & white telerecorded film prints and not 6 2” color video tape masters as they should have been. The color tapes had been wiped. There was a glimmer of hope that maybe the color tapes have been kept in the US since a run of Pertwee episodes were shown in the US in the early to mid-1970s. Sadly, this was not the case. Other stories were recovered this way but The Mind of Evil would not be one of them. 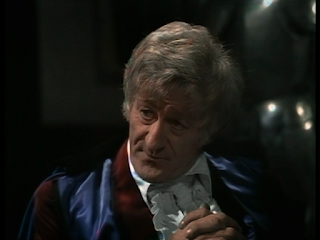 I go into great detail in a couple of articles of what happened with the color Pertwee episodes here, here and here for your pleasure. 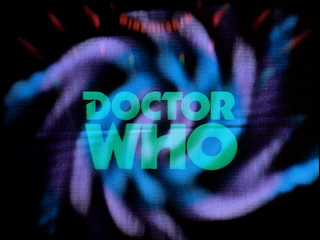 In the 1990s, new methods to restore color to many of the Jon Pertwee episodes were utilized to try and close the gap of missing color episodes. No matter what though, The Mind of Evil was a special case of its own. Then something truly miraculous was discovered. A new system called Chroma Dot Recovery came to light. With Chroma Dot Recovery, depending on how a color episode was telerecorded to black & white film in the 1970s, the color may lay dormant in the film itself. Richard Russell wrote the software that made it possible to do “wake up” this dormant color signal. The color is stored in small dots on the film. This would only work when the episode was telerecorded to black & white and if the notch filter was left off. So, there we have it, we can now have The Mind of Evil in full color. Except it’s still not as simple as that……. The discovery of retrieving color information from black & white telerecorded film prints is nothing short of amazing except for chroma dots to be present, when the black & white telerecording was made the notch filter needed to be turned off. I know, it’s a lot of technobabble. Anyway, all the black & white Jon Pertwee episode’s films prints have chroma dots with the exception of Episode One of The Mind of Evil. Here was the new dilemma as there was no other color source available for the episode. The only way this story was going to be released in color would be down to the hard work of one man. His name is Stuart Humphryes. 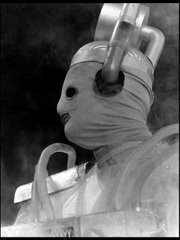 At the most simplistic level, Stuart colors black & white pictures of Doctor Who. I knew about Stuart’s amazing work for years. He started out colorizing black & white photos of Hartnell and Troughton stories in 2004 & 2005. I really got to see his work as my friend Robert commissioned him to colorize telesnaps of The Tenth Planet Episode 4 for the back cover of the second issue of Nothing at the End of the Lane. Everybody on the planet though that Stuart should recolor the difficult Jon Pertwee material that only existed in black & white. I don’t think we knew what we were asking for because it is a ton of work. Think about how hard you think it would be to re-color something to that standard of Stuart and times it by 10 and you might be close to how difficult it is to do it. It just didn’t seem feasible. I could blatantly rip off the text from Stuart’s site to fill in how difficult the effort was to recolor Episode One but I think you should just go there yourself and read about the amazing effort put forth by himself and people like Peter Crocker and Richard Russell. Click here to go to his site. Why have I dedicated so much space to explain this? Because the BBC did not dedicate any space to it. I know that this is the US release we are talking about here and they get their material from the UK. In the UK, there is nothing on the packaging at all to note that this is the first time in nearly 40 years that this story is seen in full color. I have the press release in my hands that are sent along with the preview discs and nothing is in it at all about this little miracle on DVD. I am not blaming BBC Home Entertainment here in the US; I wish the BBC in the UK would have promoted this aspect of the release better. Of all releases, there should have been a restoration feature on this one. This is insane! I will return to the quality of the episodes but what about the story itself? I hold the opinion that it is not The Dæmons that is the quintessential Pertwee Family story but this is the story that shows all of the characters in their best light. 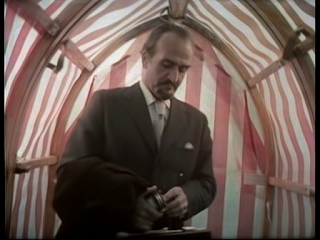 The Mind of Evil is one episode longer than The Dæmons and all of the main characters have some great moments. 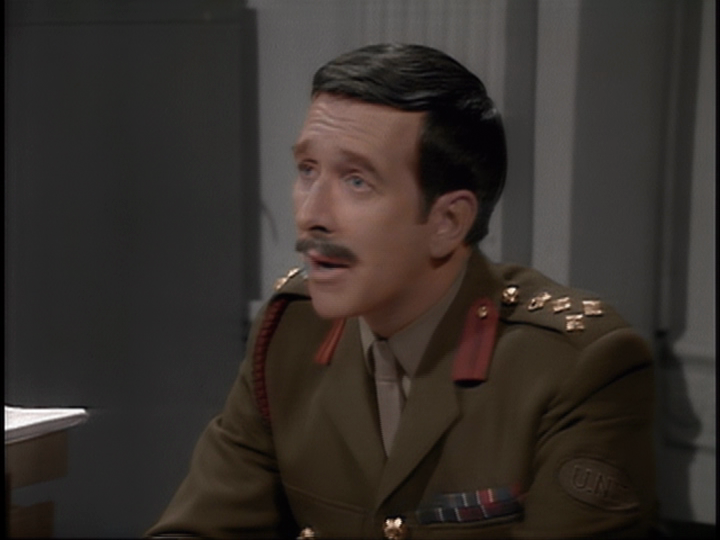 The Brigadier goes under disguise at the end of Episode 5 to lead an attack on Stangmoor Prison, Captain Yates becomes very heroic trying to track down the Master after the missile he was transporting was taken from him, Sgt. Benton has some great moments especially volunteering for duty after he was badly injured in a previous attack. Jo Grant is instrumental in getting the prison back into the hands of the right authorities early in the story. All the characters are very comfortable with themselves and it is really fun to watch. 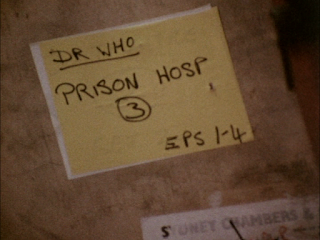 The story begins with the Doctor and Jo visiting Stangmoor Prison to see a new way of reforming criminals. The Keller Machine removes all of the evil impulses in the brain. The criminal can lead a normal life thereafter. 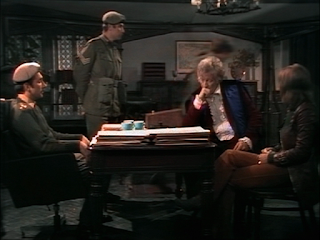 The Doctor is not convinced but he watches with Jo one of the criminals, Barnham, undergo the process. 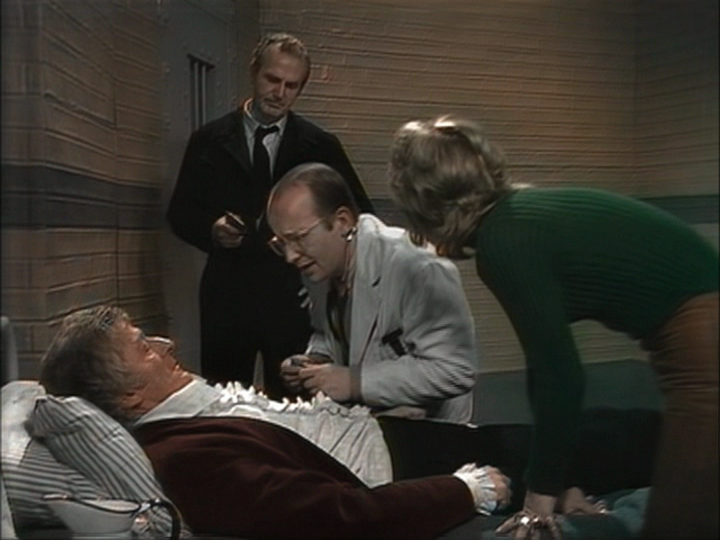 The process appears to go badly for Barnham as he lets out a terrifying scream during the procedure. It appears he is OK and is sent away to recuperate. Things start to go bad as people start to die at the prison. They are found dead near the Keller Machine; their body reflecting the death of one of their own phobias. The Doctor immediately realises that the Keller Machine is responsible for these deaths plus he experiences it for himself first hand as the machine turns on him! This is only one facet of the story. Meanwhile in London, UNIT is overseeing the first ever World Peace Conference. Things start to go badly there too. First important papers are stolen from the Chinese delegation and then one of the Chinese delegates is murdered. It seems like the events of the World Peace Conference and the murders are Stangmoor Prison are unrelated but in fact they are related. The link being a young Chinese woman named Chin Lee and the creator of the Keller Machine Emil Keller. I simply love this story. I wanted this to be one of the first stories released on DVD but this is where patience was a virtue and we were really rewarded for the wait. I hear people complain that a lot of 6 episode stories have a lot of padding in them but I just don’t agree with this story. Perhaps the only thing that gets a little old is when the prison changes hands a couple of times between the guards and the inmates. Even that, to me, is OK because it is a way for the Master to get into the prison and completely control it. There is a lot of action to the story. There are helicopters, real missiles and a great siege of the prison by UNIT. It is a great action romp that never fails to deliver. I love all the sets in this story. The prison sets are great. They seem very continuous, like one into another and it gives off a very cohesive feel to the location. 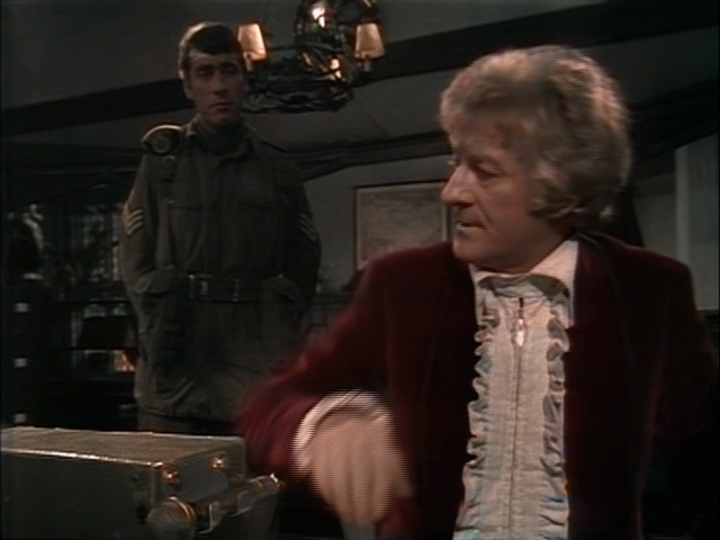 I love the Brigadier’s office in the early part of the story. What I like about it is very much what I like throughout the story which is the lighting. Now that it is in color, it is much easier to see what I am talking about. There are a lot of nuances to lighting. Corners of sets are darker with just a little bit of light to highlight certain aspects of the set such as with the Brigadier’s office or the Chinese delegate’s room. The list of actors in the story is pretty amazing too. 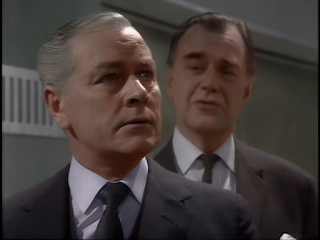 Apart from the regulars we get Michael Sheard as Dr. Summers, Pik-Sek Lim as Chin Lee, William Marlowe as Mailer and Neil McCarthy as Barnham. 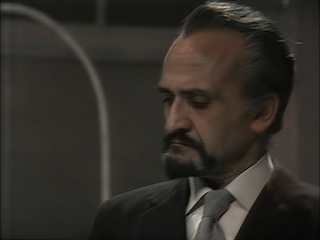 Roger Delgado as the Master is one of the highlights of not just this story or season but of Doctor Who. 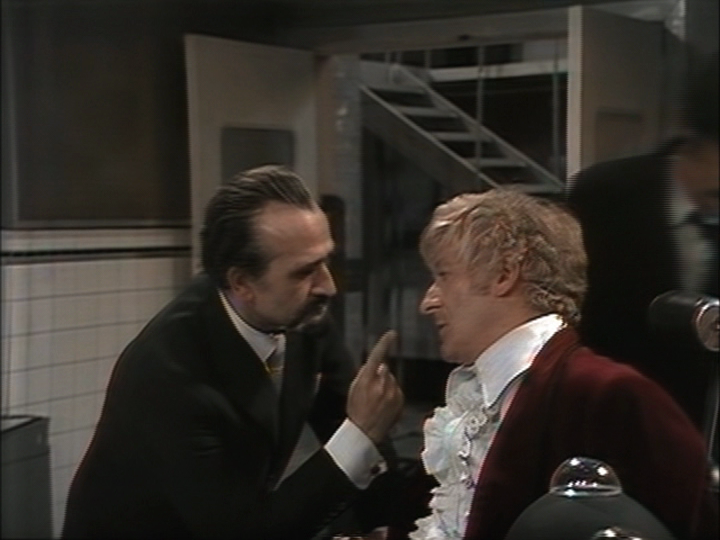 He is wonderful making a balance between villainy and being a gentleman. I just love the scenes where he is in a business suit taking command of the situation or making plans with what to do with the missile. He is such a powerful presence and one who left us way too early. My only real nit-pick would be why have the World Peace Conference across a street from a park where children are playing? My favorite aspect of this release, perhaps unsurprisingly, was the restoration. This story really should be the jewel in the Restoration Team’s crown. Like I mentioned earlier, Episode One was re-colored with Stuart Humphryes coloring 7,000 frames with Peter Crocker assisting. When watching the episode, I keep stopping myself and thinking how monumental this really is to watch. 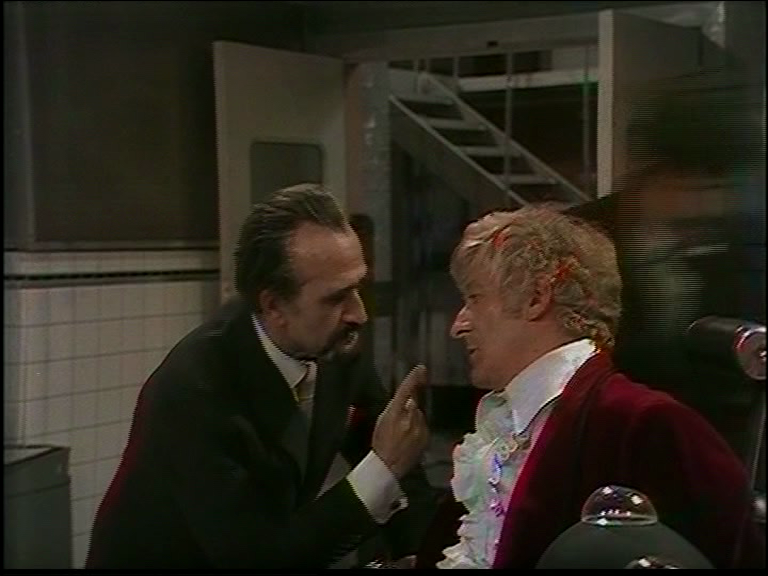 Then the other part of me just starts to giggle because I am watching The Mind of Evil Episode One in color! I simply can’t believe it! When Episode One began and went from opening titles to the Doctor and Jo driving in Bessie towards the prison, I heard myself say wow! I mean basically I heard someone in the room say wow and it was me. Then I showed a group of friends who all said wow at the same time. 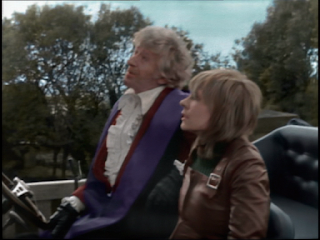 The exteriors shot on film don’t always work as well but that is because the film sequences are not great quality. Once the action moves into studio, those sequences look great. To understand the detail Stuart delivered, take a look at the map on the wall in UNIT in Episode One. It is detailed with many colors. The same can be said about the park Chin Lee goes out to for burning the papers. The details of color in those sequences are astounding. It’s even more amazing when you see the same park in Episode Two and there isn’t nearly as much color detail. Thank you, thank you, thank you Stuart! Episode 2-6 are equally wonderful. I have heard people complain about Episode Two being the least successful. It could be but I don’t see it. Certainly Episodes 3-6 look wonderful. All six episodes have the VIDfire process applied to them which gives the impression of video look to the studio interiors. I have probably watched the story about 6 times now and I still pinch myself that we have this in color. Audio Commentary: Moderated by Toby Hadoke we have Katy Manning, Pik-Sen Lim, Fernanda Marlowe, Director Timothy Combe, Script Editor Terrance Dicks, Stunt Coordinator Derek Ware, and Producer Barry Letts for his final commentary to the range. A few of these people are rotated in out of the commentary. It’s fun to listen to and I was curious about how Barry and Timothy would talk about the siege on the castle at the end of Episode Five since they had to go back and re-shoot. It moves along nicely and when a participant leaves and a new one comes in, it is not jarring. Toby, as usual, does a nice job keeping things moving and interesting. Production subtitles: Written by Stephen James Walker and Martin Wiggins, as usual are chock full of information. It’s almost too much to get my tiny little brain around. The minutia is amazing on these. I wish the authors of these production subtitles would get credit on the R1 release covers. The amount of work on this is staggering. 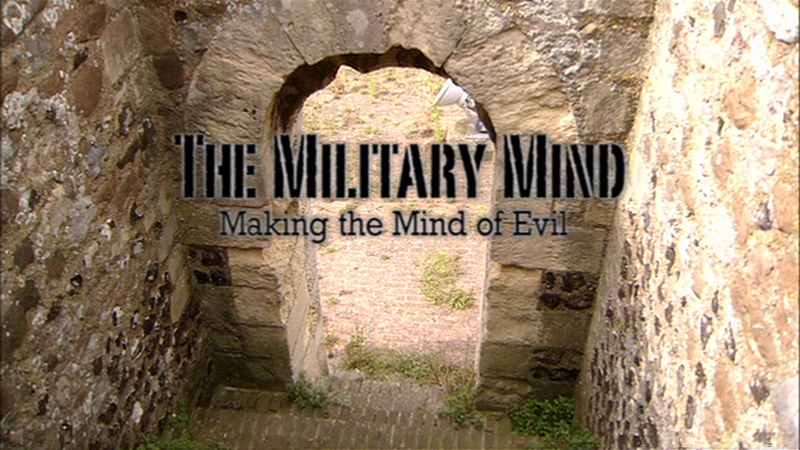 The Military Mind: The making of documentary of this story. This was shot at Dover castle which doubled for Stangmoor prison in the actual story. It features the lovely Nicholas Courtney. It was nice to see him in this; I forgot he appeared on this documentary. 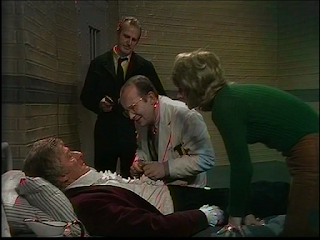 It also featured Pik-Sen Lim, Fernanda Marlowe, Terrance Dicks and Barry Letts. Timothy Combe is in this too and it is really kind of sad as the overspend on this story resulted in him not being asked back to direct anymore Doctor Who and it obviously has played on him over the years. He speaks very enthusiastically about this story. 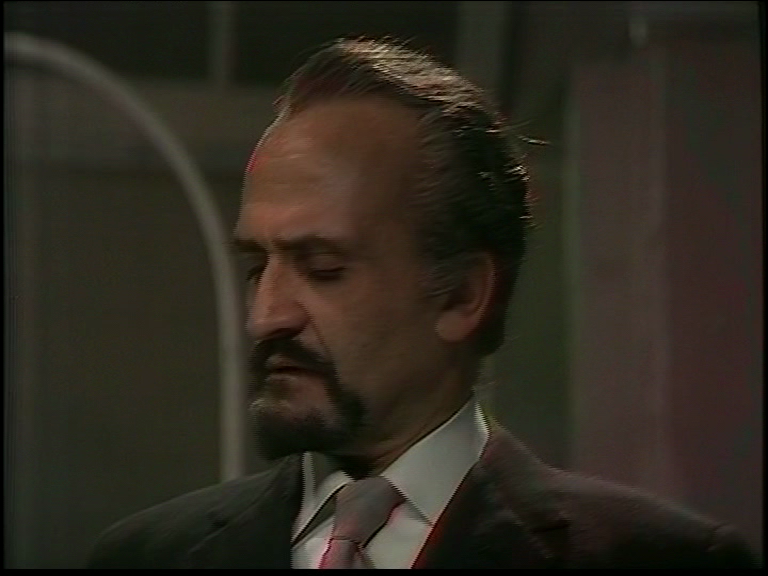 He also directed Doctor Who and the Silurians which is another one of my favorite stories. Now and Then: Film locations are revisited to show how much the area has changed if at all. Behind the Scenes: Television Centre: Norman Tozer takes us through 24 hours of being at the BBC Television Centre. 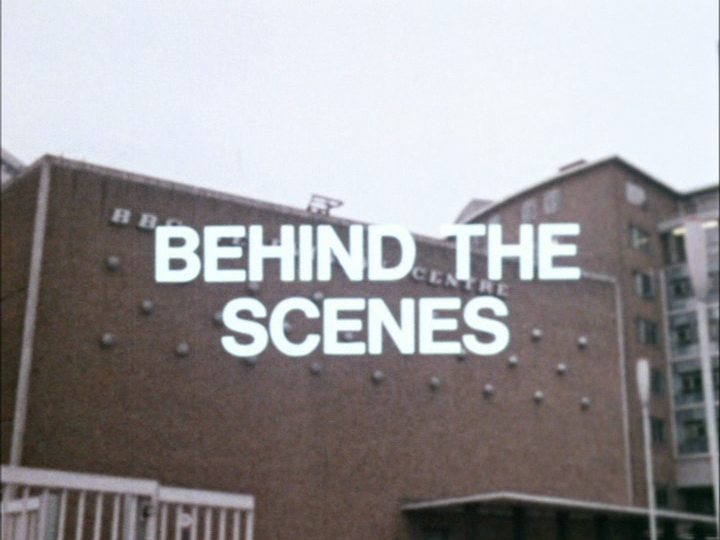 I have not hidden my love for Television Centre and this vintage film from 1971 shows us how sets are constructed to how programs are recorded. 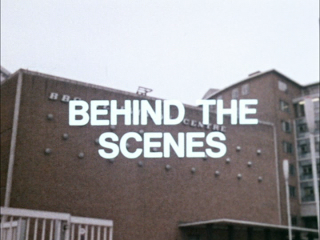 We see the rehearsal of an episode of Blue Peter plus we seem some of the program’s film sequences edited. Tozer walks around the Centre and we see how lovely the place was back in 1971. I not only mourn the loss of the complex but also the way television was made back then. All under one creative roof. I love these features and I whole-heartedly applaud their inclusion on these discs. As usual, you have the wonderful Photo Gallery and PDF materials. PDF materials for this release include Radio Times listings and 1971 Kellogg’s Sugar Smacks Promotion. Packaging: It comes in a standard double disc Amary case with a cover by Lee Binding. The cover personally does not suit me. 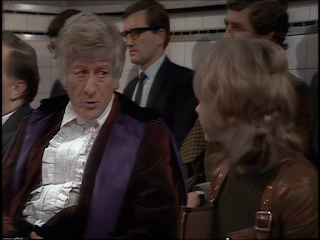 I find the image of Pertwee looks like we got a candid shot of him on a loo (possibly at Tooting Bec). Jo looks strange too. It is interesting that ever so slight from the light emanating from her pants rising up over her is the diamond shapes of the Pertwee title sequence. With this release I am able to accomplish something I have always wanted to do. 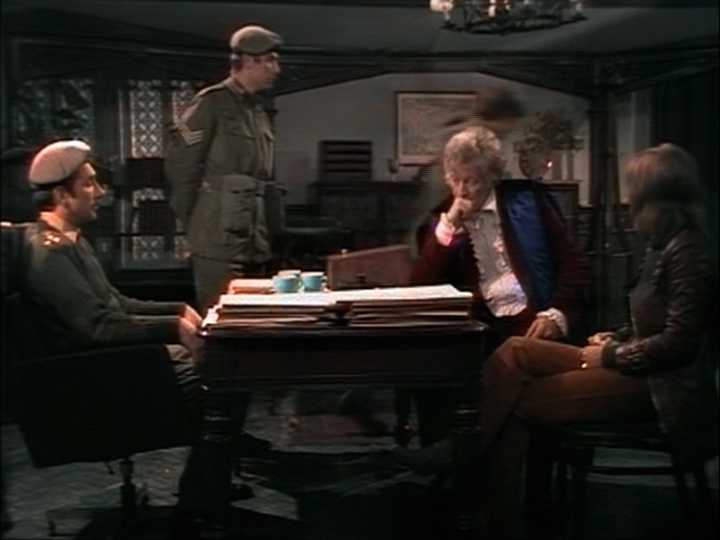 I can now watch every Jon Pertwee episode from Spearhead from Space to Planet of the Spiders in color. Perhaps the color recovery for Invasion of the Dinosaurs Part One (Invasion) isn’t perfect but that is my default version when I watch that story. Before watching this release, even more so than the others, stop and think about all of the man hours that went into this two DVD set. 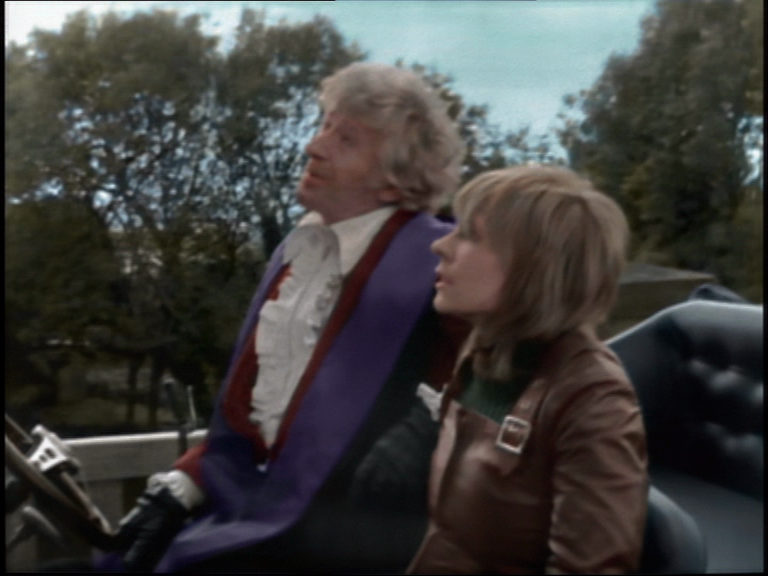 Think about the work on all the extras, Production Subtitles, Photo Gallery, Commentary, restoration and re-coloring. This was all for just one release. It is truly mind-blowing. I am humbled by the work on this release. Next week: I have more reviews to go through such as Inferno Special Edition and George Gently Series 5. I also plan to give a short article on the life of Bill Pertwee. I have it on DVD and I was really impressed with episode 1.i would love to see the timeslip colour striked episodes done that way.the colour recovery looked good too. The British release mentions the restoration in the final paragraph on the front page of the interior leaflet - do the US releases not get these? Otherwise though I think the current strategy is to downplay restoration. The assumption is presumably that the fans will know about it aleady but the general public might be put off - colourisation got a bad rep in the 1990s from the colours on some classic films. (Worldwide may also be haunted by the Who VHS sales starting to go down with the release of the Daemons.) Plus there's already been a feature on the chromadots on Planet of the Daleks and so it would be going over existing ground. Well Greg another stunning review. I must agree with your assessment about how much better episode 1 looks compared to the rest that were recoloured using the normal process. The first one's coloring was just superb. No fall outs or anything from what I could see. Well 2-6 what can be said. Its great seeing them in colour, but a few things bothered me. The uneveness of colour on faces. 1. Hair color seemed to change, and at times had too much of a glowing factor. 2. If the hair color was bad then the forehead, cheeks, and more any movement the color changed. Even in long sequences of them staring at each other one moment the face is pale next moment it looks sunburnt glowing and ready to blind. What this uneveness reminded me of was Universal's All Quiet on the Western Front. I was always unable to watch it because the lighting on the characters kept changing within the shots. In this case the colour just keeps to seem changing. It gave me a headache and that is what the Mind of Evil 2-6 does. 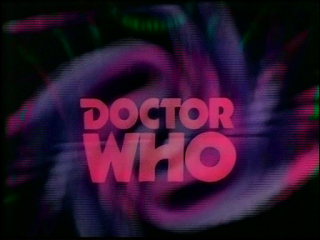 On side note I wished the BBC gave us a choice between watching this in B&W or Colour. I have only seen this in Black and White. I have always thought for some weird reason black and white made this particular serial even scarier.